The video was published on DxE France’s Facebook page and has been viewed over 5 million times. The story was covered by multiple social media platforms and news outlets. Whole Foods has legally required us to post this restraining order on our website, Facebook and Twitter to let you all know that your questions aren't welcome at Whole Foods. If you ask about their factory farms, you are apparently “putting the safety of both customers and team members at risk." When DxE co-founder Wayne Hsiung and teenage activist Ateret Goldman were arrested for asking a question at a Colorado Whole Foods, the video of the incident went viral. It has been viewed more than 3 million times, and hundreds of people around the world were inspired to take the #WholeFoodsChallenge, returning to Whole Foods to ask their own questions about the animal products being sold there. Although Whole Foods dropped the charges against Wayne after this outpouring of support, they have since retaliated with injunctions seeking to prevent any future questions from people associated with DxE.. Whole Foods is terrified of the truth, but they can’t stop it from coming out, try as they might. December 12, 2018, SAN FRANCISCO, CA – As seen on Facebook livestream, dozens of activists with the grassroots animal rights network Direct Action Everywhere (DxE) -- including Rachel Ziegler, a former Chipotle manager who investigated a company chicken supplier after growing suspicions about company animal welfare claims -- participated in a theatrical window-washing demonstration to call for increased transparency regarding how the animals Chipotle uses for meat are raised and treated. The activists held signs with photos of sick and injured chickens taken inside farms which supply to Chipotle. Ziegler says despite Chipotle’s reputation as an animal welfare leader, the company sources from many of the same conventional factory farms as other restaurants; farms where chickens have been found starving and suffering from injury and illness, farms with thousands of chickens crammed in filthy industrial sheds. The activists say Chipotle conceals its supply chain from its customers. Ziegler is also one of 58 activists arrested on multiple felony charges for attempting to provide care to sick and injured hens at a Petaluma factory farm on September 29. The Sonoma County District Attorney’s Office has since filed seven felony charges against Ziegler, among others. Activists including Ziegler say the charges are an abuse of the legal system intended to conceal systematic animal abuse at Chipotle and beyond, and will only embolden their continued demonstrations and investigatory work. DxE’s work has been featured in The New York Times, ABC’s Nightline, and a viral Glenn Greenwald exposé, and DxE activists led the effort to ban fur products in San Francisco earlier this year. Activists have been subjected to FBI raids and felony prosecutions for investigatory work. Visit Direct Action Everywhere on Facebook and at directactioneverywhere.com. Follow us on Twitter @DxEverywhere. Wayne Hsiung, the co-founder and lead organizer of Direct Action Everywhere (DxE), has studied social movements and what made them successful. He and the other co-founders decided to apply the methods that worked to create social change in the past to the animal rights movement today. More specifically, Wayne Hsiung believes that animal rights activists should use the same type of tactics that were used by Martin Luther King, Jr. and Mahatma Gandhi. Some of the tactics at first appear controversial. Nonetheless, Wayne Hsiung believes that they’re effective for the same reasons they are so controversial. In a blog titled “Why DxE brings the message inside,” Wayne Hsiung explains, “There has been an unusual sight over the past few months in fast food chains around the country and (increasingly) around the world. Animal rights activists, with DxE and otherwise, are taking their message inside the places that serve animals' mutilated bodies. Why? In the blog entry I have summarized above, Wayne Hsiung explains that while bringing the message inside places of violence is indeed disruptive to the business and the individuals breaking bread inside, it is through this “morally disruptive” act that changed is sparked. More than a restuarant, what’s being disrupted in a social conception and deeply-held values. Wayne Hsiung argues that disrupting people’s routines gets them to think in a new way about animals, and from picking up the social cues of outrage from others, to even join the movement themselves. Prerequisite: This guide assumes you already have basic working knowledge with Adobe lightroom. If this is not the case, I recommend watching a youtube tutorial such as this one. Editing alone will not turn a bad photo into a good photo, but it could turn a good photo into a great photo. I get a lot of complements and questions about the colours, “look” or ”filter” on my photos. 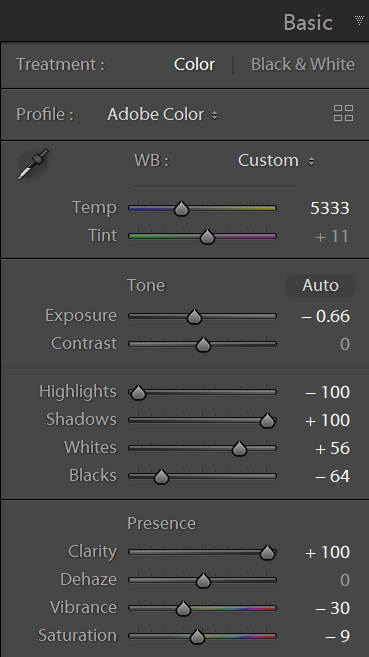 I am writing this short guide to show how anyone can achieve those looks easily using Adobe Lightroom. Some of these techniques can be transferable to Capture One or other photo management apps. 1a. An unedited RAW file shot during the Official Animal Right March in SLC. 2a. An unedited RAW file shot during the Animal Liberation Western Convergence 2018 in SLC. 2b. I was able to correct the colour temperature easily without losing quality because I was shooting RAW. 3a. An unedited RAW file shot during the Animal Liberation Western Convergence 2018 in SLC. 3b. Our eyes tend to focus first on the brightest part of a photograph. By applying negative vignetting, it focuses attention on the subject. 4a. An unedited RAW file shot during the Animal Liberation Western Convergence 2018 in SLC. 4b. Where they are a lot of images in front of us, the ones with strong contrast tend to grab our attention first. By increasing overall brightness and lowering Blacks give an image a more dramatic look. In order for these settings to be effective, you need to be shooting in RAW format, and then using Adobe Lightroom to edit. Timing is critical with activism photography. The press team often requires photos right after an action to get them out to the media, so it is important to have a workflow where you can get your photos out quickly. I tend to take a lot of photos at events, and with my limited computing power and storage, I only import the best photos. My import ratio is roughly 1:8. Having said that, do not only show your best 5 or so photos. You should aim to have a decent number of useable photos with variety, such as wide shots of large groups, small groups, and close ups of the speakers, organizers or other key people to tell the full story. Once the photos have been selected, it’s time to import. It is a good idea to apply your baseline settings to all the photos during import. Baseline settings are settings you do to all your photos. This is my own baseline preset. Feel free to try it out and adjust accordingly. Here is a helpful link on how to import a preset. Bonus Tip: Select similar photos that require the same settings, and use the Sync Settings button to save time. Once they are all adjusted, you can export them and have them shared to the press team to choose their favourites. I don’t recommend doing too much cropping at this stage, because the media often needs to do their own cropping to fit the format they need, so it is best to leave the cropping untouched. Now that the first pass edits are done, it is time to take another look at your work. We will cover the following in detail in part 2 of this article. Until then, feel free to play around with these settings on your own. “Babe” actor James Cromwell speaks to activists and government employees inside Utah State Capitol Building. November 20, 2018, SALT LAKE CITY, UT – In a dramatic confrontation caught on Facebook livestream, nearly 200 activists with the grassroots animal rights network Direct Action Everywhere (DxE) entered the Utah State Capitol building Tuesday to demand action from the governor and attorney general in response to alleged animal cruelty at Smithfield’s Circle Four Farms in Milford, Utah. The demonstration was led by renowned actor James Cromwell, who turned vegan after starring in the 1995 film “Babe,” and Wayne Hsiung, DxE’s co-founder. Other speakers included three children who pleaded with officers and the company to release a single baby pig and a woman who suffered from a life-threatening MRSA infection, an antibiotic resistant pathogen commonly found on farms. Hsiung is awaiting trial on felony charges brought by Utah Attorney General Sean Reyes, including racketeering, punishable by up to 60 years in prison, for a 2017 investigation of Circle Four Farms. Cromwell held a dead piglet recovered from a Utah farm by anonymous whistleblowers. With about ten police officers on site, he spoke passionately of compassion for animals outside and inside the building before approaching first the office of the attorney general and then Governor Gary Herbert’s office. Despite the demonstration occurring during business hours, activists could hear the door to the attorney general’s office being locked from the inside as they approached it. As Cromwell and many Utah residents stood by, Hsiung knocked on the door and requested that someone come out for discussion, but his requests were ignored, and the door remained locked. Ten other activists also held dead piglets, found at a Utah farm. The group then proceeded to the governor’s office, which was guarded by a pair of police officers. As activists gathered outside the office, Michael Mower, Gov. Herbert's Deputy Chief of Staff, came out and spoke to them. Mower acknowledged activists’ animal cruelty claims and said he would bring their concerns to the governor. Cromwell characterized the exchange as “shotgunning” -- assuaging activist concerns with polite rhetoric, but without meaningful discussion or action. “(Governor Herbert) follows the whims of his donors,” said Cromwell. Pulitzer-winning journalist Glenn Greenwald published an exposé in June in The Intercept revealing financial ties between Smithfield and DxE prosecutions -- including Smithfield’s support of both the Republican Attorneys General Association, or RAGA, as well as the Republican Governors Association, during Reyes’ and Herbert’s 2016 campaigns. Following the demonstration, Cromwell and the activists drove to Circle Four Farms. They demanded that management open the doors to allow activists to inspect conditions and provide care to animals in need. At least ten police officers were waiting when activists arrived. Smithfield staff did not meet or communicate with the activists. “We’re simply asking for a conversation around Smithfield’s stated values of transparency and being a so-called ‘leader in animal care,’” said Hsiung. 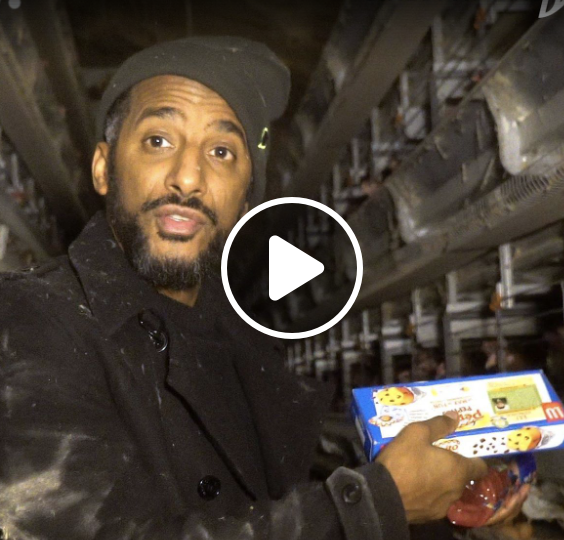 November 20, 2018, MORONI, UT – In a shocking and heartwarming turn-of-events captured on Facebook livestream, hundreds of activists with the grassroots animal rights network Direct Action Everywhere (DxE) -- including renowned actor James Cromwell and two activists awaiting felony trial for investigating turkey farming giant Norbest, LLC -- have rescued 100 turkeys in direct collaboration with Rick Pitman, who is now the owner of Norbest. The slaughterhouse rescue is the result of an unlikely friendship between Pitman and Wayne Hsiung, founder of DxE and one of the felony defendants. Rather than continuing their fight in court, Pitman has stated that he does not support the charges, and the two sides decided on a dramatically different path this Thanksgiving: generosity. Hsiung, Cromwell, and hundreds of animal rights supporters traveled to Norbest and provided vegan food to the employees of the plant and other locals. Pitman, in turn, released 100 turkeys to the activists in an act of Thanksgiving mercy. The birds were immediately taken to local sanctuaries, where they will live out their lives in happy families. Hsiung and Pitman showed that even adversaries can show compassion this holiday season. This dynamic with Norbest stands in stark contrast to another DxE investigation in Utah, which also resulted in felony charges. After DxE released an investigation exposing horrific animal cruelty at Smithfield’s Circle Four Farms in Milford, Utah -- the largest pig farm in the US -- FBI agents raided farm animal sanctuaries searching for piglets removed from the farm by activists. Six activists were later charged with multiple felonies, including a racketeering charge, punishable by up to 60 years in prison. The action was part of the Animal Liberation Western Convergence, which runs through Wednesday and has over 600 activists participating. On Tuesday, Cromwell -- who turned vegan after starring in the 1995 film “Babe” -- was again leading the way, this time it was a demonstration at the Utah State Capitol Building demanding that action be taken in response to animal cruelty at Circle Four Farms, and that charges be dropped against activists facing related charges. Cromwell then led activists to Circle Four where they planned to demand that management open the doors to allow activists to inspect conditions and provide care to animals in need. DxE activist Rachel Ziegler is arrested after having a bird ripped from her arms by police. November 9, 2018, Petaluma, CA– Following a vigil and attempted rescue at McCoy’s Poultry Farm in Petaluma in which 58 activists with the grassroots animal rights network Direct Action Everywhere (DxE) were arrested and charged on felony conspiracy, felony burglary and misdemeanor trespass charges, Rachel Ziegler and Jon Frohnmayer are set to be arraigned on seven and three felony charges respectively. Both Frohnmayer and Ziegler attended October 3 “Coffee with a Cop” and “Coffee with an Animal Control Officer” events which were streamed live on Facebook. At those events Ziegler asked authorities why they removed a sick chicken from her arms, later killing her and eight other chickens the deputies also took from activists at McCoy’s on September 29 of this year. The two say that’s why they were singled out for serious charges, while the vast majority of others arrested have been offered diversions to potentially dismiss charges. Investigators with Direct Action Everywhere (DxE) enter farms, slaughterhouses, and other agricultural facilities to document abuses and rescue sick and injured animals. DxE’s investigatory work has been featured in The New York Times, ABC Nightline, and a viral Glenn Greenwald exposé, and DxE activists led the recent effort to ban fur products in San Francisco. Activists have been subjected to FBI raids and felony prosecutions for these investigations and rescues. Visit Direct Action Everywhere on Facebook and at directactioneverywhere.com. Follow us on Twitter @DxEverywhere. Brown bears in Lake Clark National Park, Alaska. 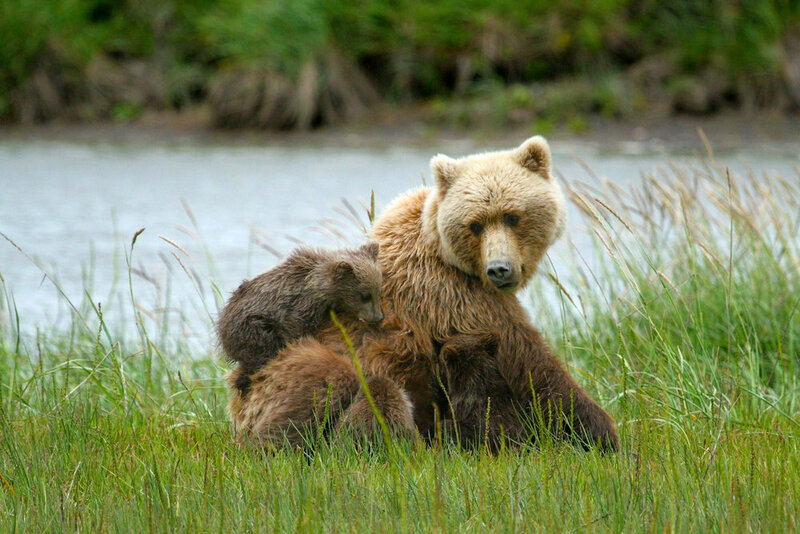 Trump signed legislation passed by Congress nullifying Obama-era regulations that banned cruel hunting methods in the massive Alaskan wildlife refuges. These methods include shooting sleeping wolf families in their dens and trapping bears in steel-tooth traps. The US EPA has delayed by two years (with the intent to eventually destroy the rule) an Obama-era rule that allows the federal government to regulate small waterways, preventing the federal government from regulating water pollution from factory farms. This is part of a larger push by animal ag to deregulate the industry. The USDA has cancelled a rule requiring that organic-certified animals have basic welfare requirements. The North Carolina legislature passed a law making it harder for people hurt by factory farms to sue for damages by setting limits on how much affected people can collect. Individuals can only collect damages up to the “fair market value” of the factory farm, regardless of how much they have been hurt.